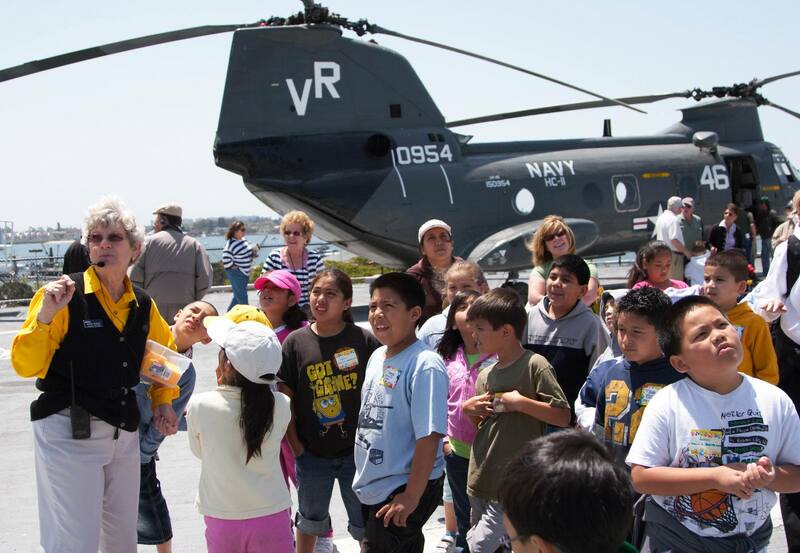 Located on Embarcadero, the focus of the USS Midway Museum is the Midway itself. It’s a vintage Navy aircraft carrier that was the largest ship in the world until 1955 and was decommissioned in 1992. Today, visitors may walk throughout the aircraft carrier, either as part of a guided tour, on a self-guided audio tour, or even un guided by anything other than eyesight and wonder. It is definitely one of the most unique museums on the world and especially meaningful to families with members who have served in our nation’s military. Plus, kids climbing into the helicopters and jets on the top deck. 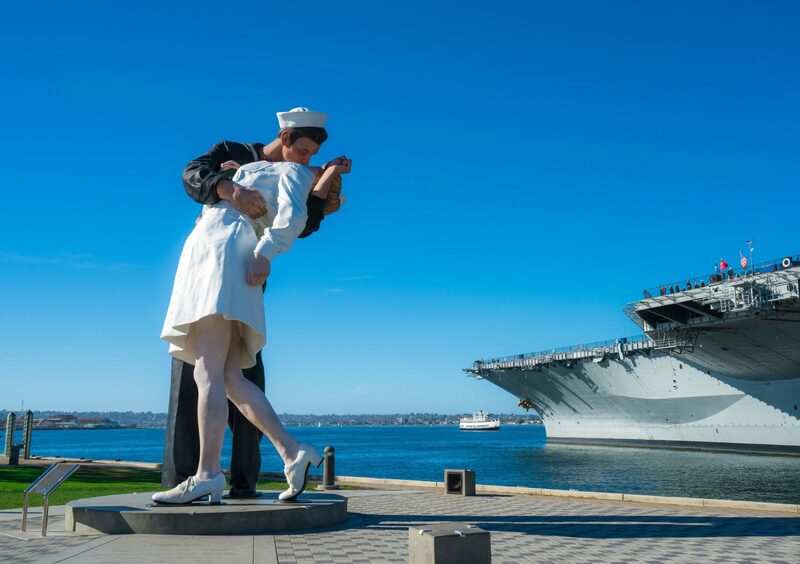 Next to the USS Midway is the enormous and a little bit controversial Unconditional Surrender statue. It’s actually part of a series of sculptures by Seward Johnson that resemble a photograph of a sailor and woman kissing in 1945 after the WWII defeat of the Japanese. The photo was also on the cover of LIFE Magazine. The Embarcadero is a term referring to an extended strip of San Diego along the bay that is a tribute to the city’s maritime culture. The central focus of it is the cruise ship terminals but the mostly pedestrianized area encompasses a number of the individual tourist sites already highlighted above. 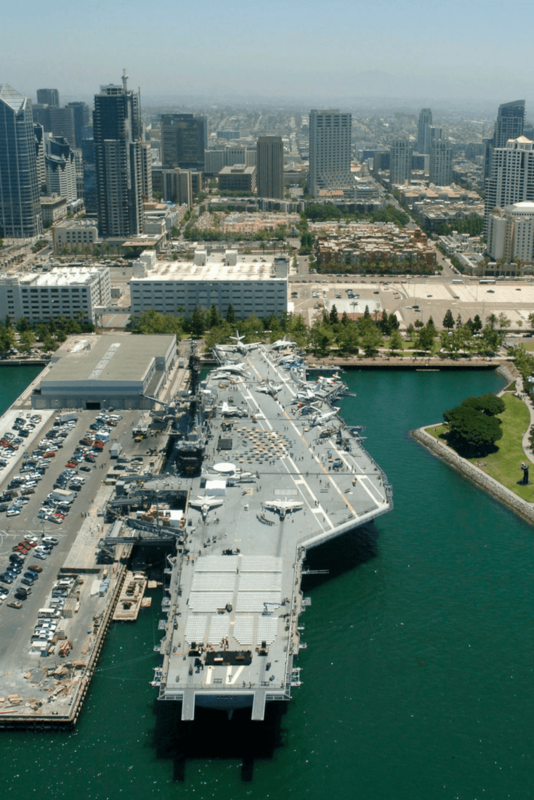 The Embarcadero runs from the shops and restaurants of Seaport Village north past the USS Midway, the Broadway Pier, the Maritime Museum and the Waterfront Park. 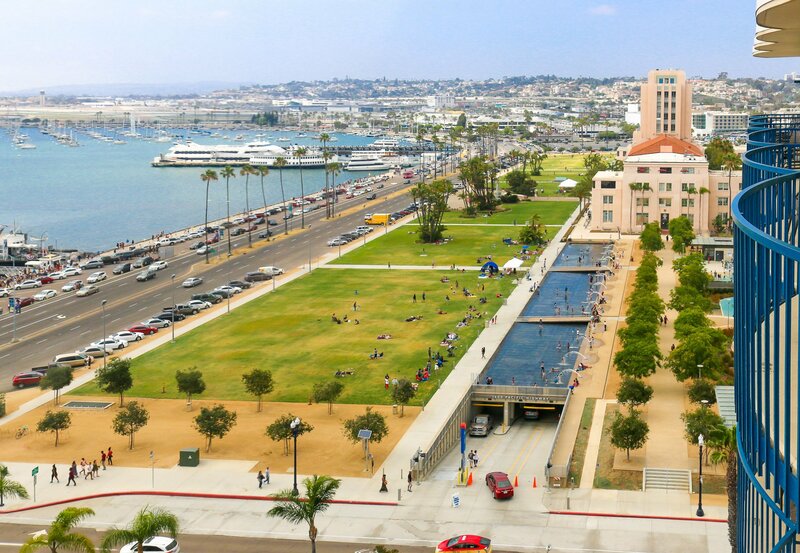 Located on the San Diego Bay in front of the Waterfront Park, near the corner of W. Ash Street and N. Harbor Drive. The Maritime Museum features a world-class collection of sailing ships, steam-powered boats and submarines. The museum is also well-known for their ability to restore old ships. The most famous ship is the 150 year-old Star of India. Seaport Village is an outdoor, waterfront shopping and dining complex where downtown San Diego hits the waterfront of San Diego Bay near the Convention Center. 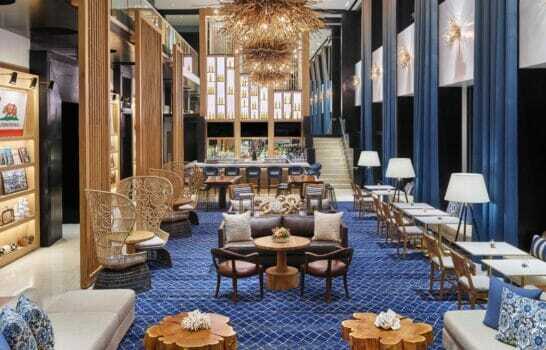 It has 54 shops, 13 casual restaurants, and four fine-dining restaurants. 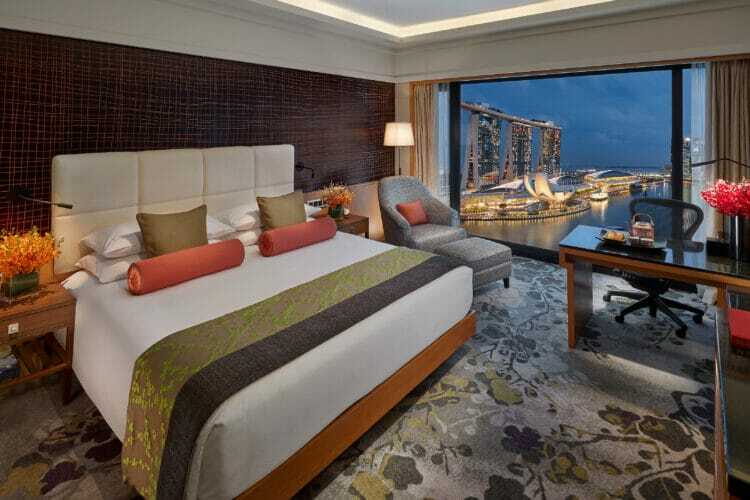 They also periodically host live music and other entertainment events. Highlights include the carousel, FROST ME gourmet cupcakes (they were on the Food Network’s Cupcake Wars), Kite Flite (you can fly kites in the adjacent park) and the various street entertainers. 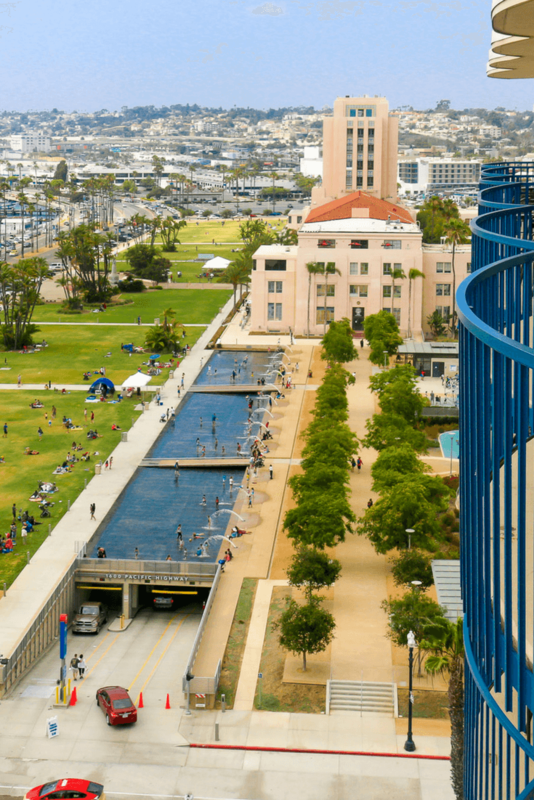 Behind Seaport Village is The Headquarters, a revitalized entertainment area inside a former jail that is home to some nice boutiques and great restaurants. Entrance to Seaport Village and The Headquarters is free. There are a number of ways that visitors may tour San Diego Bay. 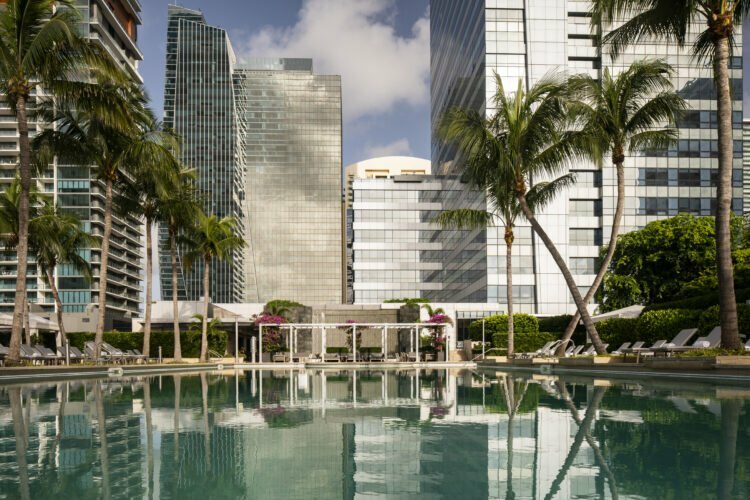 Perhaps the most well-known are harbor cruises, some even including meals such as sunset dinners and champagne brunches. Below are the most popular San Diego Bay tours to consider. SEAL Tours: The amphibious bus-boats that start off on land and plunge into the water are a hit with kids, especially. Patriot Jet Boat: It’s a high-speed, 30-minute thrill ride with spins, tricks, and turns at speeds of up to 50mph (owned by Flagship Cruises). 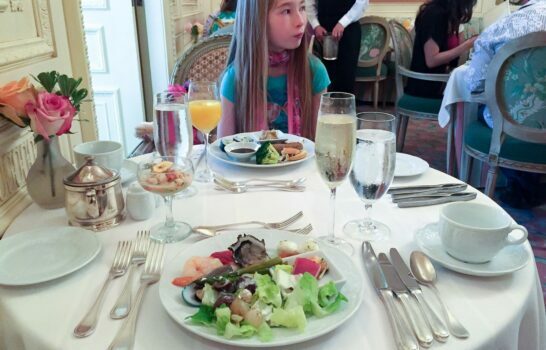 Hornblower Cruises: Book for lovely narrated harbor cruises, dinner cruises, champagne brunch cruises and whale watching. Speed Boat Adventures: Drive your own mini speedboat as part of a narrated group bay tour (fun), though note that you would catch this over at Harbor Island closer to the airport. 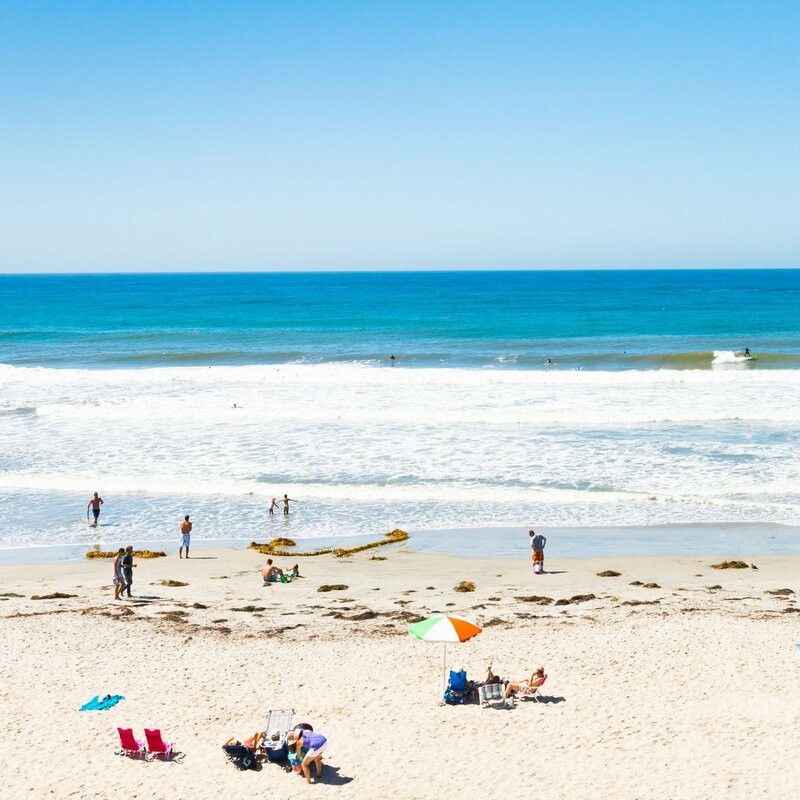 It is possible to visit Coronado and its beautiful beaches from downtown San Diego without a car. Take the 15-minute ride on the Coronado Ferry. Service each way runs seven days a week, every hour, approximately 9:00 a.m.–10:00 p.m. You may bring a bicycle (free) or a Segway, but only service animals are allowed. The current 1-way ticket price is $4.75, with kids 3 and under free. The Coronado Ferry departs from the Broadway Pier. On the Coronado side, the Ferry Landing is also a fun complex of shops and restaurants. The new Waterfront Park makes for an excellent stop between touring Little Italy (you could grab a slice of pizza or sandwich to-go there) and the Embarcadero. It’s a large public park, with our historic courthouse in the center, that features water fountain jets that kids (and adults) can run through, reflecting pools, grassy areas, and state-of-the-art play equipment for kids. They have summer movies here on the lawn, too. A several block area of Downtown San Diego, just blocks from the waterfront Embarcadero, was originally the home of Italian-American fishermen and their families. Today, Little Italy is an upscale, pedestrian-friendly neighborhood that has been dramatically gentrified in recent years to feature some of San Diego’s best restaurants, trendy cocktail bars, and boutique shopping. A myriad of events happen here throughout the year, including the Saturday morning Little Italy Mercato Farmer’s Market. The goal of the New Children’s Museum is to inspire creativity and critical thinking in kids as they interact with art. 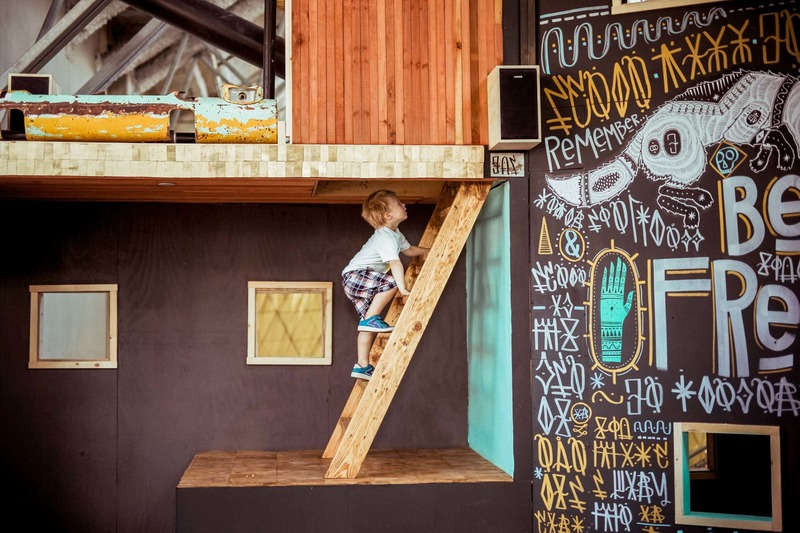 Kids love the hands-on exhibits and drop-in art studios where at any time they can create something with clay, paint, blocks, bubbles and other crafting materials. This fabulous museum is one of the the best things to do in downtown San Diego with kids (especially if they are young). The Bean Sprouts cafe inside is a national brand of cafes designed for families to eat playfully, with some good-for-you items shaped like flowers, funny faces and more. The Museum of Contemporary Art San Diego, otherwise known as MCASD, focuses on works of art in all media from 1950 to present day. Emphasis is placed on the largely binational nature of San Diego with its location adjacent to the Mexican border. Be sure to check the schedule for current exhibitions and public programs. It’s also located in a historic building, the old Santa Fe Depot baggage terminal. The San Diego Padres have been playing Major League Baseball in San Diego since 1969. 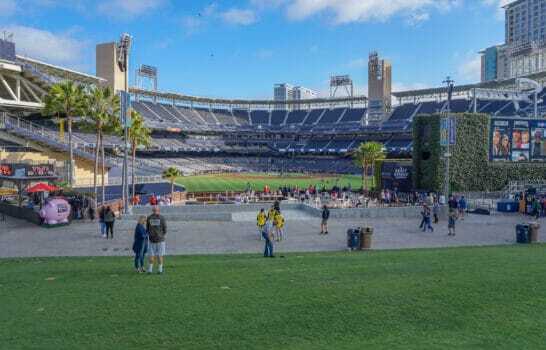 When their brand new downtown baseball stadium, PETCO Park, opened in 2004, going to a Padres game became even more of an attraction for those who aren’t necessarily Padres fans, or even fans of baseball generally. The stadium itself and its restaurants and other activities has become an attraction. It’s a family-friendly environment and tickets can be bought directly from the Padres ticket office either in person or online. Regular season Major League Baseball games are typically played from April through September. Be sure to check the Padres’ schedule to see when they are playing. Outside of Padres games, a guided tour of PETCO Park also enables visitors to go behind-the-scenes to see the Padres’ dugout, the press box, and more. 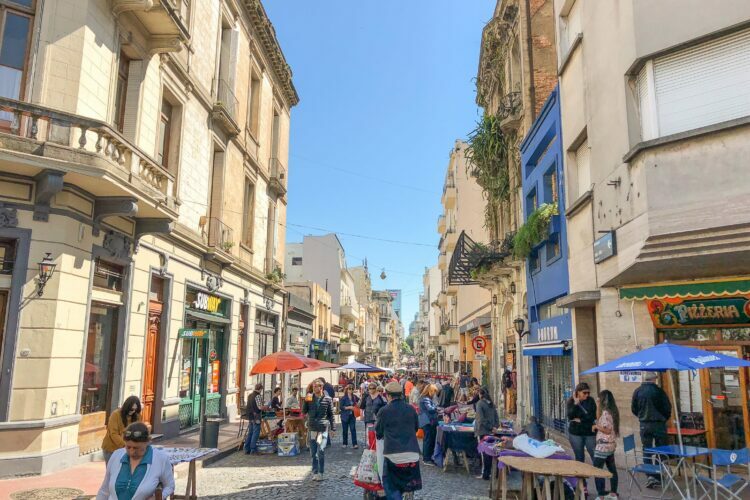 GoCar Tours offers visitors the opportunity to rent a sporty go-cart style vehicle to see the city, complete with GPS audio directions to guide you where you where you want to go. San Diego is just one among several cities in the United States and Europe in which this service is available. GoCar Tours offers various rental packages, including a 4-hour rental, an all-day rental, and a package with a speedboat tour as well. Redeveloped in the 1980s, the Gaslamp Quarter is a 16-block area of Downtown known as one of San Diego’s premier sports for restaurants, bars, clubs, nightlife, music. The odds are that if visiting Downtown San Diego, you’ll pass through it anyway. 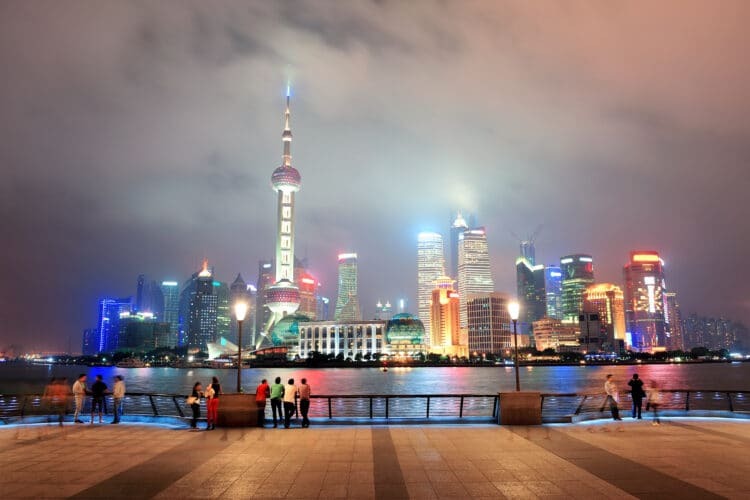 It is the best area in town for dancing and nightlife. How about the thrill of a combined ”˜Land & Sea’ tour? 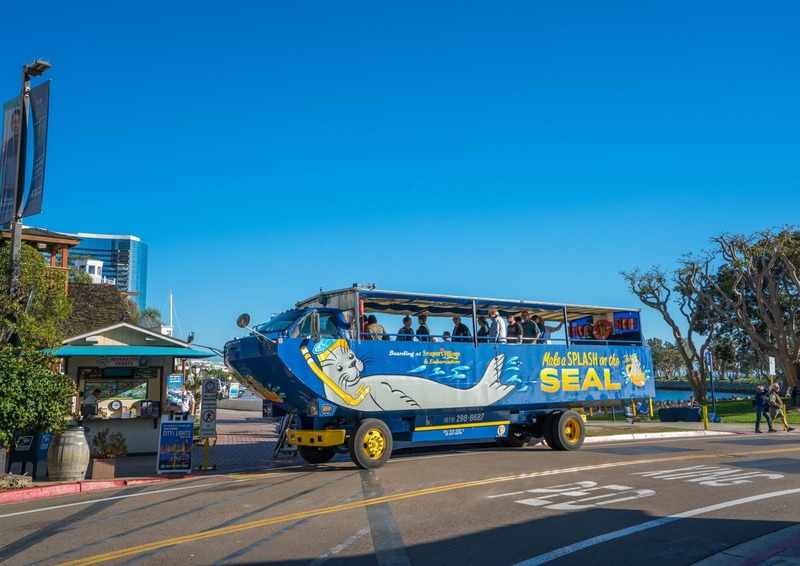 SEAL Tours allows you to see the sights along the streets of San Diego and then plunge into the waters of the San Diego Bay to explore the San Diego Harbor, all while riding in a single amphibious bus-boat vehicle with the signature cartoon seal painted on the side. SEAL Tours depart from both Seaport Village and from another spot along the Embarcadero. It’s a must-do when visiting Downtown San Diego with kids. 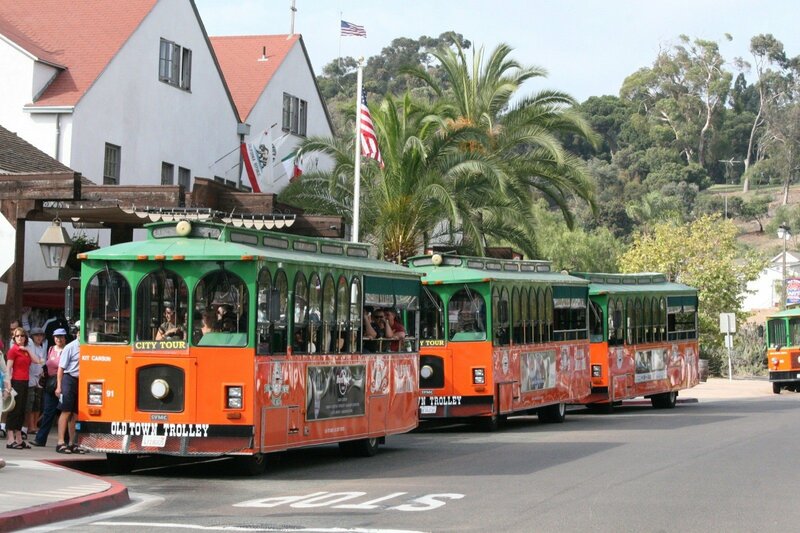 The Old Town Trolley is among the most longstanding, well-known ways to tour San Diego. Their signature orange and green vehicles that look like vintage San Francisco-style streetcars have been a familiar site around town for years. Don’t let the name fool you. The tour routes cover much more of San Diego than Old Town. 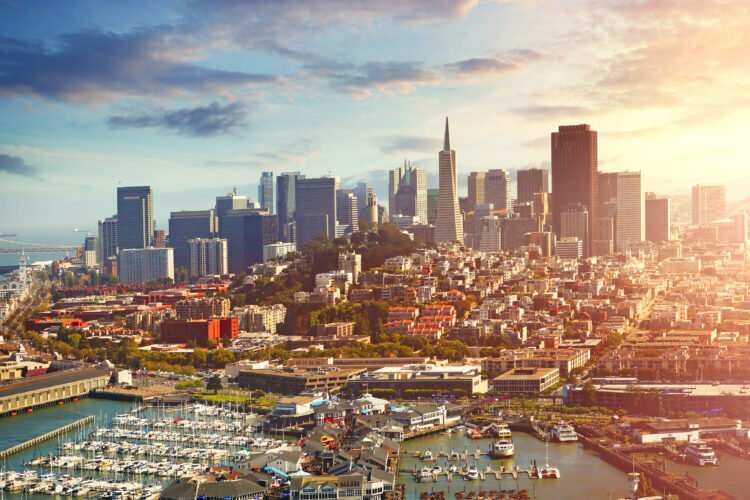 It’s possible to join the tour at several stops in Downtown including at Seaport Village, the Embarcadero and in the Gaslamp Quarter. 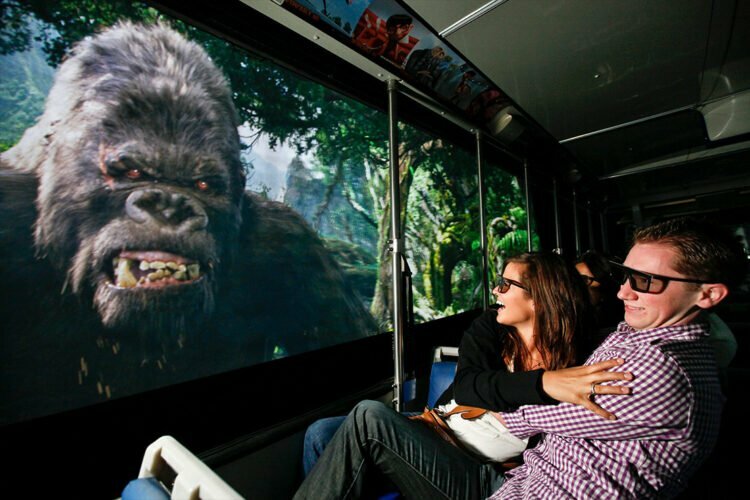 Tickets come with unlimited hop-on, hop-off privileges, too. The San Diego Metropolitan Transit System operates a great public trolley system that expands your exploration of San Diego well beyond downtown, without a car, and in a cost-effective, convenient way. Trolley stops dot several locations in downtown. On the trolley, it’s possible to hop on the lines to head north to Old Town or Little Italy, north east to Mission Valley for shopping, concerts and other events at Qualcomm Stadium, and even south all the way to the US-Mexico border if you want to explore Tijuana for the day (be sure to have Global Entry or Sentri for expedited customs lines). The San Diego Symphony has been a proud local institution for over 100 years. They play in Copley Symphony Hall downtown, an easy walk for anyone staying in a Downtown San Diego hotel. But, this isn’t your average symphony as they’ve done a fantastic job of evolving with the times. 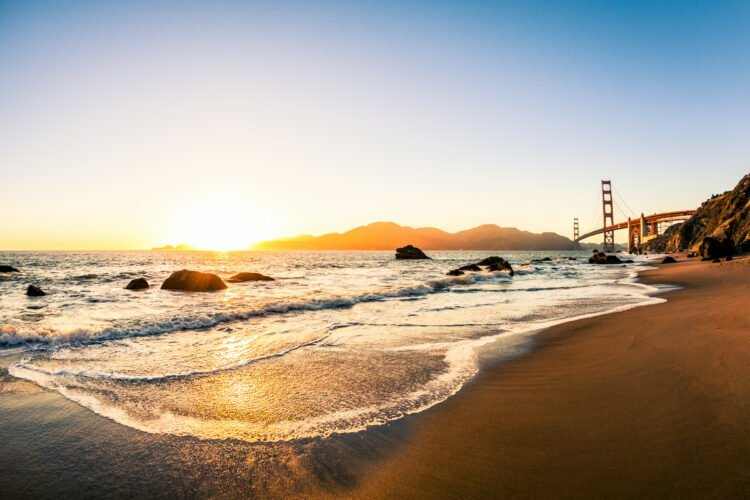 In summer, the Symphony hosts the Summer Pops, a really fun outdoor family-friendly event on the bay. 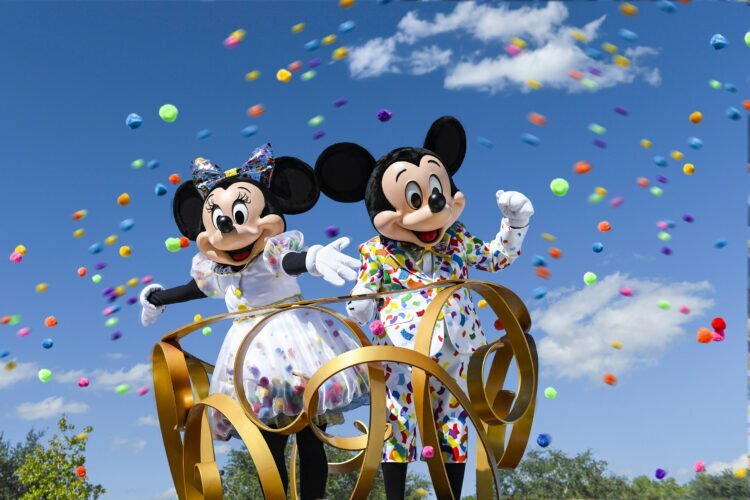 Programming for the Summer Pops varies from concerts set to Disney movies to performances with famous musicians. It’s really cool and I highly suggest it if you’re visiting with the kids (or without) during its season. Details about upcoming concerts and events are available at the San Diego Symphony’s website. The Tuna Harbor Dockside Market happens every Saturday from 8:00 a.m.–1:00 p.m., on a harborside dock on the northern edge of Seaport Village. It’s an open-air seafood market offering fresh-caught seafood and aqua-farmed seaweed direct from local fishermen and vendors. This market enables local chefs and the public to get closer to their food sources. San Diego has become increasingly renowned in recent years for its locally-crafted beers and for its budding food and restaurant culture. There are number of companies that now offer tours of the city’s culinary highlights, enabling visitors to taste San Diego with the aid of expert guidance. Two popular food tour companies, So Diego Tours and Bite San Diego, have Little Italy food tours and Downtown San Diego food tours. Social Cycle is a “16-seat party on wheels” offering public and private tours, bachelor and bachelorette parties, and pub crawls, among other things. Essentially, it is a vehicle that looks like a moving 16-seat bar on wheels and is pedal-powered by the continuous bicycling of its passengers. There are routes in Downtown, North Park, Hillcrest, Little Italy, and Pacific Beach. It looks like an amazing way to see some of San Diego’s urban breweries. They often have discounted tickets on Groupon. 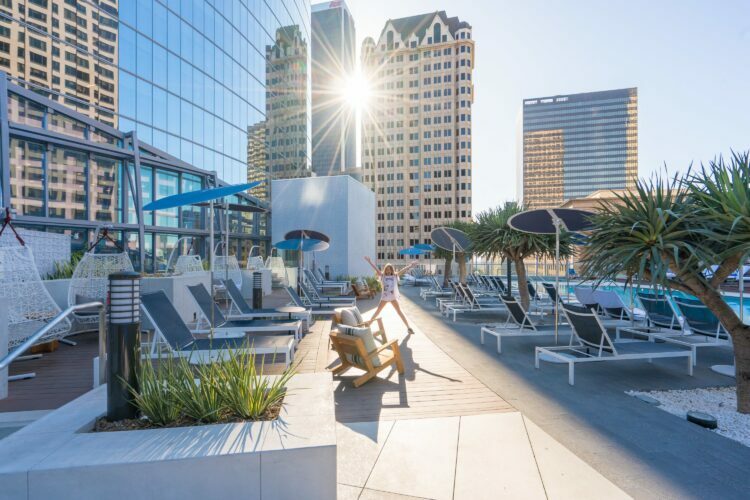 Pendry San Diego: It is our newest and best luxury boutique hotel in the area, a part of Preferred Hotels and Resorts and Montage Hotels & Resorts. 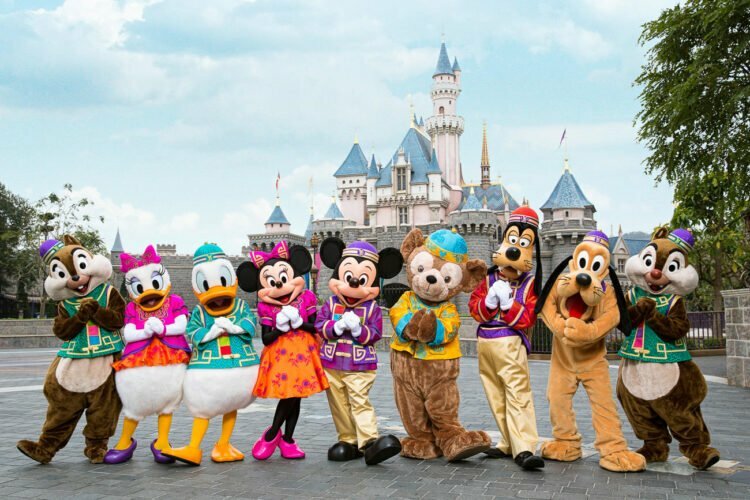 Which one you choose really depend on whether you have kids traveling with you, time of year, view desired, loyalty program and much more! 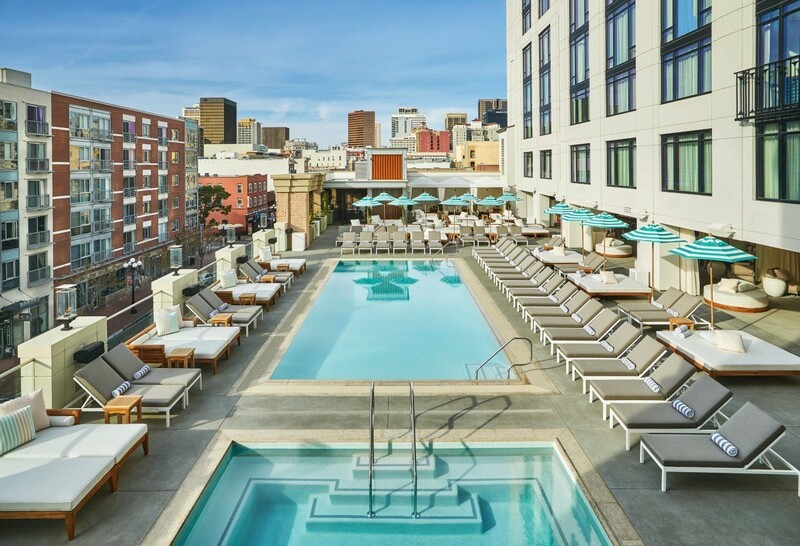 If you are looking at Pendry, The US Grant or need help picking a San Diego hotel, let me know. What are your favorite things to do in Downtown San Diego? 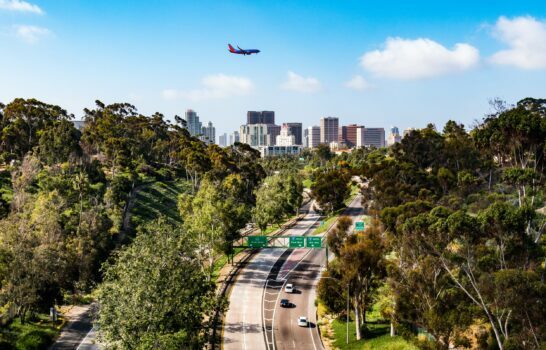 Getting Around San Diego: Do You Need a Car Rental?